Gov. Dannel Malloy on Thursday said officials from FEMA and the U.S. Army Corps of Engineers have wrapped up a two-day visit to the state to evaluate pyrrhotite, the mineral suspected of causing concrete foundations to crack in the eastern part of Connecticut. In August, several Connecticut homeowners whose homes were damaged because of foundations crumbling called for a federal investigation. State officials estimate up to 30,000 homeowners are affected by the problem. Malloy said on Thursday that officials were in the state for the past two days to evaluate the mineral. Authorities were discussing with Connecticut lawmakers how they would lend their technical expertise to assist the state with the crumbling foundations issue. The federal team, which briefed state leaders, explained their visit was just to consult. Further assistance would have to be ordered by FEMA, or literally, an act of Congress. That didn't discourage legislators about the visit. "I think it's more than symbolic. I think it shows that there is a level of concern at the federal agencies," South Windsor State Representative Tom Delnicki said. During their visit, the FEMA and Army Corp of Engineers experts met with homeowners and scientists. Their goal was to evaluate the current federal resources in the state to determine if more is needed to create future regulation. Malloy said the group will be in contact with lawmakers at the end of the month to have a more "broad discussion of their findings." "From the beginning, I’ve been very clear that I believe that we must have assistance from our federal partners to address this issue. I’m thankful that FEMA and the Army Corp of Engineers sent some of their best scientists to Connecticut to study this issue," Malloy said on Thursday. In the meantime, Malloy said he asked the Army Corps of Engineer scientists to provide "short order" guidance on standards that can be implemented for both quarries and companies that manufacture concrete. The state and local government group working to tackle the concrete crisis was debriefed on the visit. It says the big takeaway is that more federal research is needed on how pyrrhotite, the naturally occurring mineral found in the crumbling basements, makes concrete crack. Plus, more research is needed on how to reduce the cost of fixing affected homes. However, the group knows the main focus must be getting people money to defray the cost of replacing a basement, which can exceed $200,000 and is usually not covered by insurance. In all, the federal team visited five homes in north-central and eastern Connecticut Wednesday. So far, 581 homeowners have reported to the state that they have crumbling concrete. 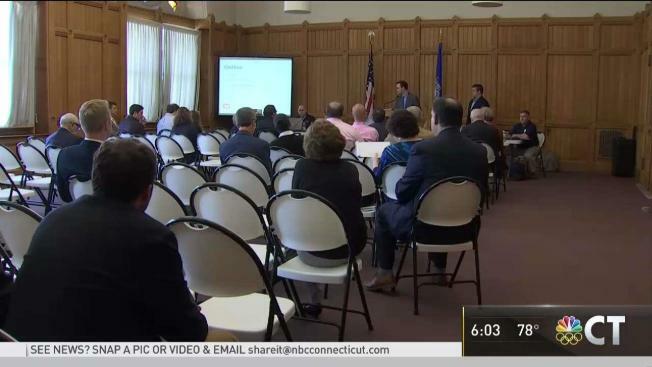 Malloy also asked experts to determine a low-cost standardized test that Connecticut homeowners could use to help everyone better understand the scope of this problem to their property.